Although it may appear to be a gas station that serves deli, we like to think of Phat Italian as more of a deli that serves gas. Seriously, the fuel for your car is second to the food for your belly, which is so good you might accidentally forget to fill up the SUV. The restaurant-gas-and-grocery was founded by New Yorkers who wanted to bring the City to the mountain. Its aisles are even named for beloved NYC streets. Phat Italian is Killington’s only Italian deli featuring Boar’s Head meat, fresh bread delivered from New York daily and signature sandwiches. The fully stocked market has everything you need for pick up or vacation … and even catering. The menu is huge, or shall we say ‘phat’. 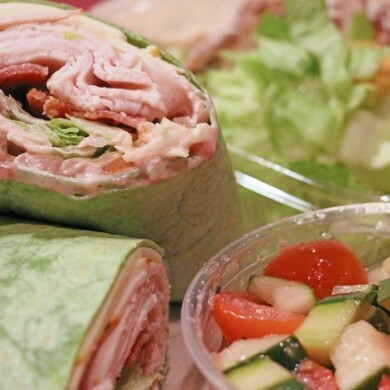 Choose from breakfast sandwiches, hot sandwiches, cold deli sandwiches, paninis, green salads, pasta salads, potato salads – even a juice and smoothie bar. We tried the Carmine the Cranberry – a delightful combination of Boar’s Head turkey, Muenster cheese, smoked bacon, lettuce, tomato and cranberry mayo. For breakfast, try the Neal Diamond – two eggs, hash browns, cheddar cheese and your choice of meat on a roll. At lunch, order ‘The Phat Italian.’ The deli’s signature sandwich features imported prosciutto, cappicola, sopressata, provolone, lettuce, tomato, onion, roasted red peppers and Italian dressing. A dinnertime dish sure to please? Chicken Francaise, the classic entrée of chicken medallions sautéed in a light lemon garlic sauce with capers. This is a perfect stop for grab-and-go lunches before you head out for a day of adventure. Be sure to check out the daily special. Across from the deli is a beer cave, where you’ll find some of the coldest brews on the mountain, as well as a wine and cheese room. They also have the standard gas station munchies, a small grocery store and other essentials. Phat Italian is located at 2384 Killington Road in Killington, VT. For more information, please visit the Phat Italian website or call (802) 422-7428.